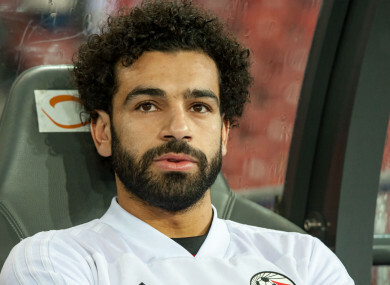 LIVERPOOL FORWARD MOHAMED Salah says he is “insulted” as an ongoing dispute with the Egyptian Football Association over the representation of his image rumbles on. The Liverpool winger appears in a team photo on Egypt’s official plane, provided by official sponsor WE. Salah, the Premier League’s top goalscorer, has his own sponsorship deal with rival telecommunications firm Vodafone. On Saturday, Salah’s agent Rammy Abbas took to Twitter to comment on the situation, writing: “We have not even been contacted for a resolution! Nothing! Complete silence! Egypt’s Minister of Sports and Youth Khaled Abdel Aziz said that he plans to intervene to try and resolve the issue with the World Cup looming. “We’ll be in touch with all associated parties to solve the issue, especially that the Egyptian national team is preparing for the World Cup,” he wrote on Twitter. Egypt qualified for the World Cup for the first time since 1990, with Salah scoring a last-gasp penalty in a 2-1 qualifying victory over Republic of Congo last October. Email “Salah 'insulted' by ongoing image rights dispute with Egyptian FA”. Feedback on “Salah 'insulted' by ongoing image rights dispute with Egyptian FA”.